Centennial squares off with Independence in a Thursday night district bout. Thursday night’s game between the Centennial Cougars and Independence Eagles is a matchup between two programs that are looking to get back on track after recently suffering disappointing losses. The Eagles, who are coming off a bye week, are riding a two-game losing streak after giving up 29 unanswered points in the fourth quarter of a 43-42 defeat against Blackman on Sept. 26. As for the Cougars, they’re hoping to rebound after losing 24-0 to Ravenwood a week ago. 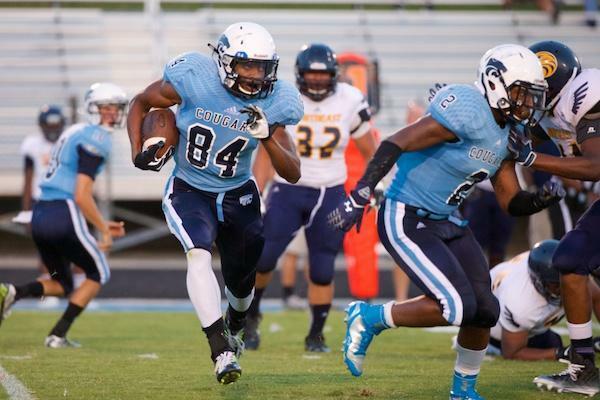 Centennial’s offense will attempt to get back to its explosive ways after gaining only 110 total yards last Friday. The Eagles’ defense has the task of going against Centennial’s trio of talented playmakers in wide receiver Emanuel Hall (22 rec., 455 yds, 7 TDs) and running backs Deon Sanders (707 rush yds, 102 receiving yds, 11 TDs) and Tyrel Dodson (240 rush yds, 4 TDs). A big key for Centennial will be its ability to not give the ball away. Against Ravenwood, CHS quarterbacks Owen Rietveld and Owen Roth combined for three interceptions. While the turnovers were a problem, Rector said it’d be counterproductive for him to tell his quarterbacks to avoid making those mistakes. With junior quarterback Andrew Bunch at the helm, the Eagles have stormed to an average of 36.5 PPG this year. Bunch has recorded 1,514 passing yards, 268 rushing yds, 21 TDs (6 run) and two interceptions. His top targets are wide receivers Nate Johnson (32 rec., 656 yds, 10 TDs) and Seth Huner (34/624/3). Not only can the Eagles beat teams through the air, but they can also control the game by utilizing running backs Dom Childress (462 rush yds, 80 receiving yds, 3 TDs) and Jordan Pope (247 rush yds, 45 receiving yds, 3 TDs) on the ground. One advantage the Cougars have on defense is their pass rush, as they’ve recorded 23 sacks this fall. Led by linebacker Chandler Stump (37 tackles, 9 TFL, 7 sacks, 1 FF) and defensive lineman Dylan Phillips (37 tackles, 8 TFL, 4 sacks, 1 int. ), Centennial will look to disrupt Bunch’s timing throughout the night. If he makes any mistakes, safety Trent McDermott (35 tackles, 4 TFL, 3 ints) and linebacker Tyrel Dodson (17 tackles, 1 sack, 2 ints, 1 TD) have the ability to make him pay. Sam McGaw is the sports editor for Franklin Home Page. Email him at sam@brentwoodhomepage.com. You can also follow him on Twitter @SamMcGawSports.